The trope of the starving college kid is an unfunny reality for the roughly one-third of college students who report skipping meals or eating less due to a lack of money for food. Wisconsin’s HOPE Lab has conducted two prior studies of the food and housing struggles of community college students, but this year’s much broader study expanded the scope to survey 43,000 students at 66 institutions in 20 states and the District of Columbia. The findings are sobering: 36 percent of university students were “food insecure” in the 30 days preceding the survey, and 36 percent also were “housing insecure.” Housing insecurity encompasses not just the threat of homeless but also includes measures like not paying utilities or rent bills in full; living with more people than the housing situation supports; and moving two or more times in a year for financial reasons. Researchers note that hunger and housing insecurity disproportionately affect “marginalized” students—probably not the ones whose parents are footing the full bill for private tuition—and students who work long hours. Former foster children were found to be the group that reported the highest instances of basic-needs insecurity. 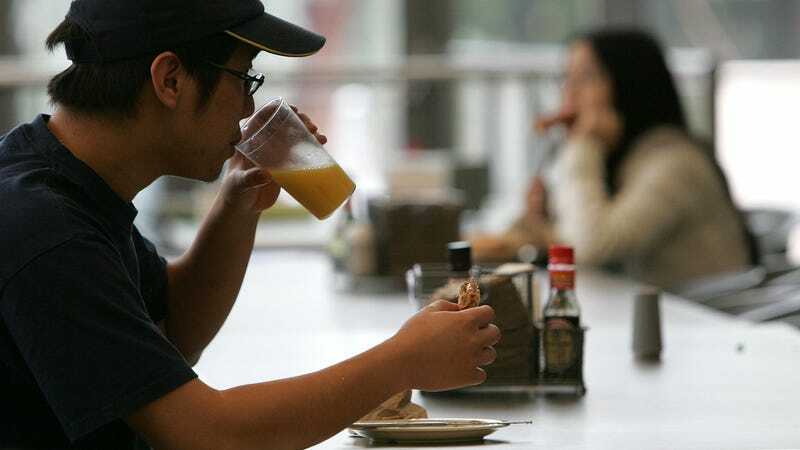 Overall, roughly one-third of community college students and one-quarter of university students said they skipped meals or reduced the size of their meals because of a lack of money for food. Regardless of what your home situation is like, the study notes, hungry students have to do the same amount of work as the students with full cupboards. “Basic needs insecurities are associated with poor academic outcomes,” researchers state, and can negatively impact graduation rates. The study refers to food and housing insecurity among students as a public health issue. Despite the pervasiveness of the problem, the study offers some possible solutions: The College and University Food Bank Alliance serves many campuses around the country, and has grown from 12 members in 2012 to 591 members in 2018. More university administrators are looking into the viability of campus food banks as public attention to the problem grows. Connecting students with public assistance could also offer some relief; a 2016 study found that only 20 percent of California students eligible for CalFresh, the state’s Supplemental Nutrition Assistance Program, take advantage of it. While these programs offer some sustained relief—especially SNAP—they don’t explain how college and university systems can support structural changes that would address the causes of students’ food insecurity in the first place.